So After a pretty long time here I am back with another haul video. Now so many launches and I get tempted so much that I always end up buying few. I love seeing haul pictures and videos and so I always love to shoot for them too. 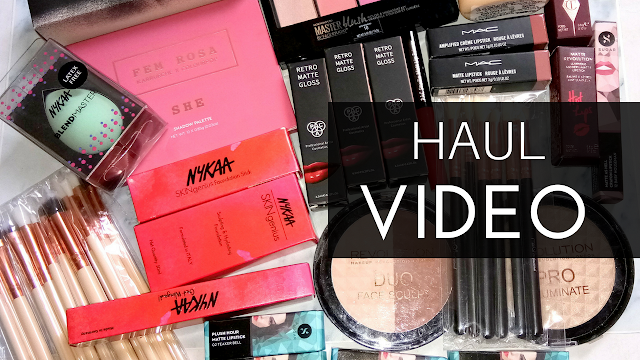 Every time I shoot haul video I always keep all the queries related to my purchase that have been asked by my readers and subscribers. If you are interested to see what I bought apart from reading the list then here is the video. SUGAR COSMETICS PLUSH HOUR MATTE LIPSTICKS (ALL 6) (REVIEWED HERE: https://youtu.be/LWlWya6pJ7o ) PRICE RS.499/- EACH FOR 3.9g OF PRODUCT. NYKAA FOUNDATION IN SHADE O3. PRICED RS.575/- EACH. 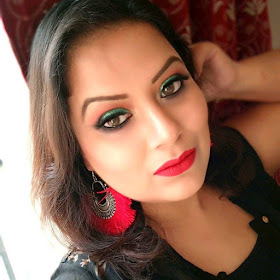 NYKAA FOUNDATION STICK IN SHADE 02. CHARLOTTE TILBURY MATTE REVOLUTION LIPSTICK IN SHADE VERY VICTORIA. CHARLOTTE TILBURY HOT LIPS IN SHADE ELECTRIC POPPY. NYKAA BEAUTY BLENDER IN RS.425/- EACH. FENTY BEAUTY FOUNDATION IN SHADE 240. I BOUGHT FROM INSTA STORE: NOWANDWOWCHENNAI IN RS.3400/-. MAC COSMETICS LIPSTICKS "BABY'S ALL RIGHT" AND "MMMMM" IN RS.1650/- EACH FROM INSTA STORE NOWANDWOWCHENNAI. COLOURPOP FEM ROSA SHE PALETTE IN RS.1650/- FROM INSTA STORE KOSMETIKS. RANDOM MAKEUP BRUSHES FROM ALIEXPRESS.